Golden Software is excited to announce the release of Strater. 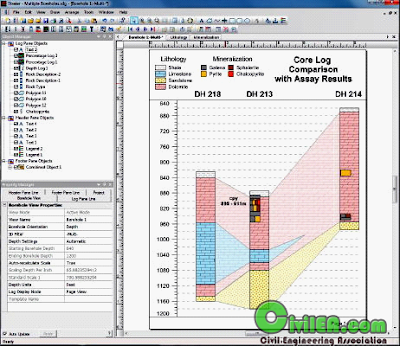 Strater is a well log and borehole plotting software program that imports your data from a multitude of sources (database files, data files, LAS files, ODBC, and OLE DB data sources). Strater provides innumerable ways to graphically display your data. All the logs are fully customizable to suit your needs. 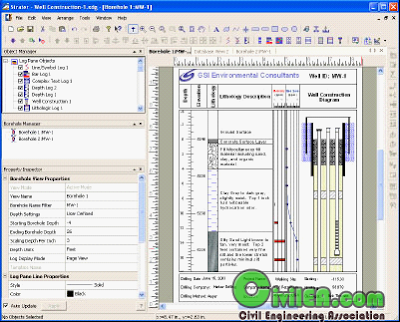 Design and save template and scheme files to make log creation efficient and consistent, create multi-page continuous logs, and quickly display new borehole logs. Utilize the header and footer panes to store all the information about the logs, such as well number, driller, location, method, company name, and company logo. The flexibility Strater offers is unparalleled. Grapher is an easy to understand technical graphing package for anyone who needs to create publication-quality graphs quickly and easily. With Grapher, creating graphs is quick and easy. Create one of more than 40 unique 2D or 3D graph types in Grapher 8! Customize any portion of any graph to make the graph completely unique to your situation! There are four different types of 2D graphs that can be created in Grapher: linear, bar, polar, and specialty graph types. In addition, many of these graph types are available with a 3D aspect. If you need an extra variable plotted on your graph, try one of the 3D XYZ graphs, the contour maps, or surface maps! - Product Tutorials available in each program - Go to Help | Tutorial within Strater.